Except when the product is as lightweight as Diorskin Airflash Spray Foundation. This has to be the lightest, the most fluid formula, that perfectly mimics the skin's texture. 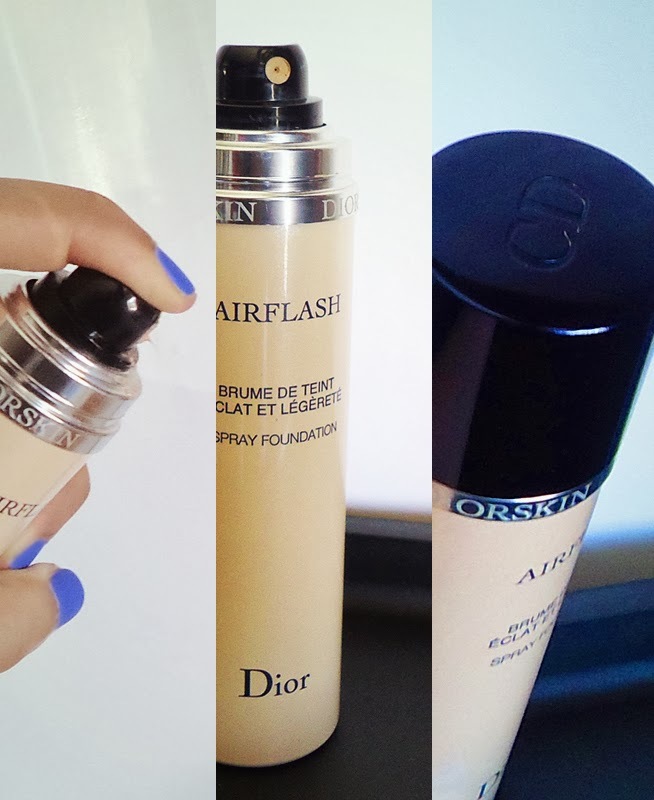 If you love CHANEL Vitalumière Aqua Foundation for it's undetectable quality, then you'll love this. Even though the CHANEL one has more coverage, you can definitely build up with this formula. My shade is Medium Beige 300, and, I should point out that (at least) this shade does oxidize a little bit during the day. But don't worry, it's not too obvious. You can only notice it when inspecting closely on a mirror. My advice is to use it sparingly and blend out the edges. You might observe, in the photo above, that the mist is so light that you can barely see it, but trust me, it dispenses quite a lot of product without you noticing it — and it's quite messy! The best way to apply this foundation, in my opinion, is by spraying it on a buffing/duo-fibre brush and blending it out from the center of the face. You'll feel an immediate cooling effect, from the moment the foundation comes into contact with the skin. If you do choose to spray it directly, make sure that you don't spray too close — at least 30cm afar — and protect the hair with a turban! If this method works for you, then you'll have the base done in a few seconds! How awesome is that? A quick note: the one I own has a navy cap, but now you can find it with a silver one. I believe it's the same formula, they just updated the look to match the new Airflash products - CC Primer (a colour correcting primer) and Matte Touch (a finishing powder).